Help! I Have Been Yarn-Bombed. How Can I Retaliate Within The Law? The phenomenon of yarn bombing or guerrilla knitting has made its way to Scotland, however it has not been well received by the council. Some lovely wool work left on a cycle path in Dumfries was deemed to be litter by Dumfries and Galloway council and is to be removed. The group responsible have been identified as the "Bollard and Chicane Protection Authority". 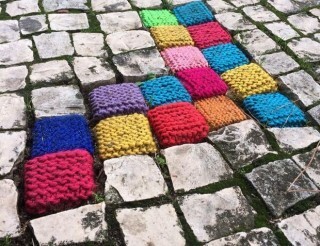 The group leave knitted and crotched items on bollards and railings to draw attention to them so that people don't bump into them. A guerrilla group with a cause. They even ensure they sew in a reflective thread so that their creations can be seen on the bollards and railings at night. However, the vigilante group have been condemned by the local authority who state that if people have a problem with the placing of bollards and street furniture they should bring it up with the council directly. Who knows, they might even do something to remedy it one day. "We appreciate arts and crafts in the region and this is certainly a very colourful way to draw attention to an issue. If the group contact the council we would be happy to listen to their thoughts." "Most people seemed to think it was a cheery intervention for a dreich February day, but it seems we're not appreciated by everyone." That sounds a little threatening to us. So, just in case we have put together the legal guide to yarn bombing in the UK, whether you love it or hate it. Ok, so my local cycle path has been Yarn-bombed. After I got over the fact that this kind of thing could happen in a neighbourhood like mine, I have decided it's quite nice and we should probably just keep it. In fact I might join them, I heart yarn. What can I do? As long as you live in the area you can petition the council to keep the knitting up or even to allow the area to be a free-knitting zone. You will require 25 others who live in the area to sign the petition for it to be considered by the council, however this may vary between local councils so you should check their website to be sure. You will then be invited to a committee to discuss the issue. You will present your case and you can invite others to assist you in doing so. At the end of the committee it will be decided what will happen and whether any action needs to be taken. My local cycle path has been yarn-bombed and I am furious. I hate the colours and I really enjoyed the element of danger I had previously by not being able to see the bollards. It made me feel like a stunt man. It even goes in my garden a little bit and I feel violated. I want to get whoever done this, but legally- I'm not some kind of mad man. Similarly, you can also petition the council if you want them to take action to get rid of something or to get them to put a sign up informing people of the consequences of naughty knitting. In this circumstance you may not even need to petition but just phone and speak to the council about the issue and they will be able to give you an answer or solution. Local authorities have the power to spot fine people for littering but also have the power to impose a fine of up to £2500 for persistent littering. If you can identify who is doing the knitting, you could report them to the council or to the police who can impose a fine. You may also feel like a detective. For more information, read our free Legal Guides on the UK Criminal Justice System. To find your local knitting, stunt man or detective group consult the notice board in your local community hall.